Cut the eggplants lengthwise. Using a spoon, scoop out most of the inside of the eggplants leaving about ½ inch thick bowl/shell. Cut up the scooped out eggplant flesh into small ½ cubes. Brown the ground beef and pork in a large frypan on medium high heat. Once the meat is fully cooked and no longer pink, drain the grease. Add the onion, pepper and cut up eggplant. Cook until the onions and peppers are tender. Remove from heat and let the filling come to room temperature. In a large bowl, mix the meat filling with the bread crumbs, milk, parmesan cheese, parsley, tomatoes, salt and pepper. Place the eggplant halves on a baking sheet and scoop ¼ of the filling in each eggplant half. 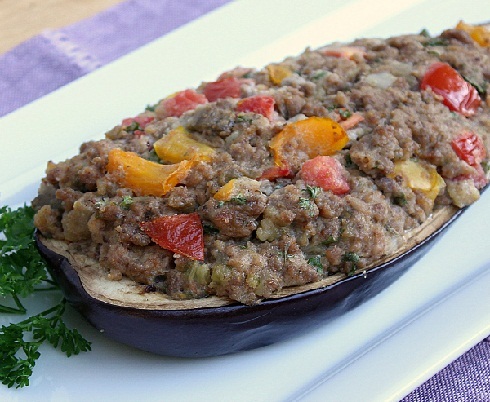 Bake in a 375 oven for 75-90 minutes or until the eggplant shells are soft and tender.